Flax seed flour (Linseed flour) milling machines in commercial scale. Flax seed flour may be produced by milling flax seed in a Universal mill with plate attachment. 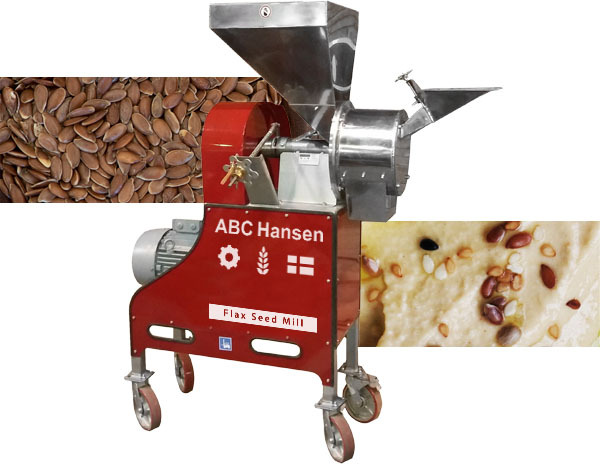 Machines for cleaning and separating flax seed seeds can also be obtained from ABC Hansen. Flax seed flour may be processed as a fine or crunchy flour and is widely used to improve digestion and is used in granola for instance. It is also used by people on banting diets and for those intolerant of wheat or other grains containing gluten. Flax flour and seeds are often used in multigrain breads. Note however that ground flax seeds can go rancid in as short a time as one week and should be packed immediately after milling without exposure to air and light and can then be stored for up to 9 months and for 20 months and longer under warehouse conditions at room temperature.